It is no secret that there has been some turmoil revolving around China‘s Ultra events. Originally slated for June of 2018, Ultra Beijing did not go off as planned. Instead, the event was postponed to this September. Many of the scheduled acts still played shows in Beijing, albeit in local clubs and music venues. Fast forward to today’s date, and it seems that the Ultra China team still has some kinks to work out. It seems now that the event in question is not Ultra Beijing, but rather that of Ultra Shanghai. While reports of its assumed cancellation were floating around, it seems that it has finally been confirmed. Ultra Shanghai was scheduled to take place September 8-9. Ultranauts need not worry though, as China’s other UMF is still set to go on. Ultra Beijing is scheduled for September 15-16 and will feature the likes of Armin Van Buuren, Axwell ^ Ingrosso, DJ Snake, Zedd, and many many more. 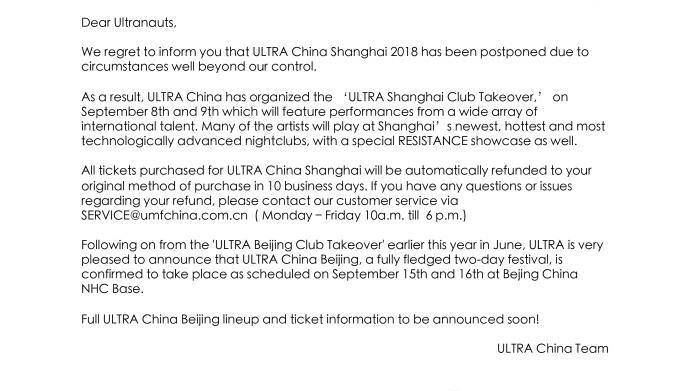 Check out the official statement below put out by the Official Ultra China team. For more information be sure to stay tuned to EDMTunes, as well as the official Ultra Beijing site.